Reading and share top 2243 famous quotes and sayings about Reflect by famous authors and people. Browse top 2243 famous quotes and sayings about Reflect by most favorite authors. 1. "Professor Dr Moritz-Maria Von Igelfeld often reflected on how fortunate he was to be exactly who he was, and nobody else. When one paused to think who one might have been had the accident of birth not happened precisely as it did, then, well, one could be quite frankly appalled." 2. "From Koltovitch's copse and garden there came a strong fragrant scent of lilies of the valley and honey-laden flowers. Pyotr Mihalitch rode along the bank of the pond and looked mournfully into the water. And thinking about his life, he came to the conclusion that he had never said or acted upon what he really thought, and that other people had repaid him in the same way. And so the whole of life seemed to him as dark as this water in which the night sky was reflected and water-weeds grew in a tangle. And it seemed to him that nothing could ever set it right." 3. "You want me to come clean, I will. I'll tell you everything. Who I am and what I've done. Every last detail. I'll dig it all up, but you have to ask. You have to want it. You can see who I was, or you can see who I am now. I'm not good," he said, piercing me with eyes that absorbed all light but reflected none, "but I was worse." 4. "Nevertheless, when it is your lot to have to endure something that is (or seems to you) worse than the ordinary lot of mankind, Spinoza's principle of thinking about the whole, or at any rate about larger matters than your own grief, is a useful one. There are even times when it is comforting to reflect that human life, with all that is contains of evil and suffering, is an infinitesimal part of the life of the universe. Such reflections may not suffice to constitute a religion, but in a painful world they are a help towards sanity and an antidote to the paralysis of utter despair. - about Spinoza"
5. "She had been struck by the figure of a woman's back in a mirror. She stopped and looked. The dress the figure wore was the color called ashes of roses, and Ada stood, held in place by a sharp stitch of envy or th woman's dress and the fine shape of her back and her thick dark hair and the sense of assurance she seemed to evidence in her very posture.Then Ada took a step forward, and the other woman did too, and Ada realized that it was herself she was admiring, the mirror having caught the reflection of an opposite mirror on the wall behind her. The light of the lamps and the tint of the mirrors had conspired to shift colors, bleaching mauve to rose. She climbed the steps to her room and prepared for bed, but she slept poorly that night, for the music went on until dawn. As she lay awake she thought how odd it had felt to win her own endorsement." 6. "Reflection can be painful, but reflection can also be productive." 7. "Why must we all concealWhat we think, how we feel?Must there be a secret meI'm forced to hide?I won't pretend that I'mSomeone else for all timeWhen will my reflection showWho I am inside?" 8. "If you would reflect well and wisely, you would realize that those events you regard as personal misfortunes have served a useful purpose even in this worldly life, and indeed have worked for your betterment." 9. "Finally, after a glance at Notre Dame and a brisk trot through the Louvre, we sat down at a cafe on the Place de l'Opera and watched the people. They were amazing -- never had we seen such costumes, such make-up, such wigs; and, strangest of all, the wearers didn't seem in the least conscious of how funny they looked. Many of them even stared at us and smiled, as though we had been the oddities, and not they. Mr. Holmes no doubt found it amusing to see the pageant of prostitution, poverty and fashion reflected in our callow faces and wide-open eyes." 10. "The debate raged on for so long, at last Saphira had interrupted with a roar that shook the walls of the command tent. Then she said, I am sore and tired, and Eragon is doing a poor job of explaining himself. We have better things to do than stand around yammering like jackdaws, no? ... Good now listen to me.It was reflected Eragon, hard to argue with a dragon." 11. "When we begin to reflect Christ, the Bible, when more understood as being centered around Christ, seems to be potentially every man's biography regarding God's promised experiences and truth for him - his individual, unique path of humbling oneself before the Lord and then being exalted by the Lord back into his true and righteous personhood. Many followers may speak of it merely to try to change other people (before changing themselves), but the prophets speak of it as a living word which miraculously tells their very own experiences." 12. "Inside all of us, she reflected, were smiling bones. She would do her best to remember from now on that even on the hardest days there was always a smile underneath her skin." 13. "Livia." He seemed thrilled to let the word roll off his tongue. "Do you know that I'm invisible? ""No one has really seen me in years." Blake looked at the sky. "Sometimes I wonder how they know I don't have a home. I try to dress decently." He waved a hand at his jeans and army jacket. "I think it just seeps out of me. I'm not the same as everyone else." He shook his head, his eyes reflecting a weary despair. As he looked at Livia again, the despair was chased away with a grin. "But when you saw me for the first time, you actually saw me. You saw me, and then you smiled like I was just the same as everyone else on that platform." 14. "There are three principal means of acquiring knowledge... observation of nature, reflection, and experimentation. Observation collects facts; reflection combines them; experimentation verifies the result of that combination." 15. "When you go out onto the stage, all the preparation has to be forced into your subconscious. For the moment of the performance, we all have to return to a new level of unconsciousness. All the reflection and all the doubts have to be laid aside before you start." 16. "BRETShe looked like a Parisian river..JEMAINEWhat, dirty?BRETShe looked like a chocolate eclair..JEMAINEThat's rare.BRETHer eyes were reflections of eyes..JEMAINEOhh, nice.BRETAnd the rainbows danced in her hair..JEMAINEOh yea.BRETShe reminded me of a winter's morning..JEMAINEWhat, frigid?BRETHer perfume was Eau De Toilette..JEMAINEWhat's that mean?BRETShe was comparable to Cleopatra..JEMAINEQuite old?BRETShe was like Shakespeare's Juliet..JEMAINEWhat? 13?" 17. 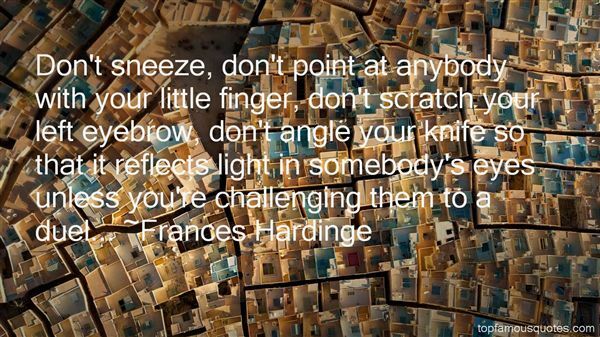 "Don't sneeze, don't point at anybody with your little finger, don't scratch your left eyebrow, don't angle your knife so that it reflects light in somebody's eyes unless you're challenging them to a duel..."
18. "Currently she was midway through a bittersweet David Nicholls novel that any other time might well have made her self-indulgently reflective." 19. "Go back to that night when Divine Light, in order to illumine the darkness of men, tabernacled Himself in the world He had made… The angels and a star caught up in the reflection of that Light, as a torch lighted by a torch, and passed it on to the watchers of sheep and the searchers of skies. And lo! As the shepherds watched their flocks about the hills of Bethlehem, they were shaken by the light of the angels And lo! As wise men from beyond the land of Media and Persia searched the heavens, the brilliance of a star, like a tabernacle lamp in the sanctuary of God's creation, beckoned them on to the stable where the star seemed to lose its light in the unearthly brilliance of the Light of the Word." 20. "Reflect on the "I" which can grasp all this. If the "I' can grasp the idea of the universe and its laws, then that "I" stands above all other things, stands aside from all other things, judges them, fathoms them. In that case, the "I" is not only liberated from earthly axioms, the earthly laws, but has its own law, which transcends the earthly. Now, whence comes that law? Certainly not from earth, where all reaches its issue, and vanishes beyond recall. Is that no indication of immortality? If there were no personal immortality, would you be worrying yourself about it, be searching for an answer?...." 21. "Perhaps many of the perplexing problems of the new music could be put into a new light if we were to reintroduce the ancient idea of music being a reflection of nature." 22. "In 1857, Bizet departed for Rome and spent three years there. He studied the landscape, the culture, Italian literature and art. Musically he studied the scores of the great masters. At the end of the first year he was asked to submit a religious work as his required composition. As a self-described atheist, Bizet felt uneasy and hypocritical writing a religious piece. Instead, he submitted a comic opera. Publicly, the committee accepted, acknowledging his musical talent. Privately, the committee conveyed their displeasure. Thus, early in his career, Bizet displayed an independent spirit that would be reflected in innovative ideas in his opera composition. [The Pearl Fishers - Georges Bizet, Virginia Opera]"
23. "I comfort myself with the reflection that your wife will possibly be able to curb your desire--I admit, a natural one for the most part--to exterminate your fellows." 24. "What words she had thought to write on the face of the moon were washed away from her as she submerged, trying to disturb no one, nothing. Trying not so much as to interrupt a current, even trying not to shatter into soft-edged platelets the green moon in the reflection. Trying to sidestep having any influence at all, now and till the end of her life." 25. "The one I felt and still feel most is lack of time. I used to have time to think, to reflect, my mind and I. We would sit together of an evening and listen to the inner melodies of the spirit, which one hears only in leisure moments when the words ofsome loved poet touch a deep, sweet chord in the soul that until then had been silent. But in college there is no time to commune with one's thoughts. One goes to college to learn, it seems, not to think. When one enters the portals of learning, one leaves the dearest pleasures--solitude, books and imagination--outside with the whispering pines. I suppose I ought to find some comfort in the thought that I am laying up treasures for future enjoyment, but I am improvident enough to prefer present joy to hoarding riches against a rainy day." 26. "People who read your ideas tend to think that your writings reflect your life." 27. "It started embarrassing me. I began to feel like such a nasty little egomaniac." She reflected. "I don't know. It seemed like such poor taste, sort of, to want to act in the first place. I mean all the ego. And I used to hate myself so, when I was in a play, to be backstage after the play was over. All those egos running around feeling terribly charitable and warm. Kissing everybody and wearing their makeup all over the place, and then trying to be horribly natural and friendly when your friends came backstage to see you. I just hated myself." 28. "How can another see into me, into my most secret self, without my being able to see in there myself? And without my being able to see him in me. And if my secret self, that which can be revealed only to the other, to the wholly other, to God if you wish, is a secret that I will never reflect on, that I will never know or experience or possess as my own, then what sense is there in saying that it is my secret, or in saying more generally that a secret belongs, that it is proper to or belongs to some one, or to some other who remains someone. It's perhaps there that we find the secret of secrecy. Namely, that it is not a matter of knowing and that it is there for no one. A secret doesn't belong, it can never be said to be at home or in its place. The question of the self: who am I not in the sense of who am I but rather who is this I that can say who? What is the- I and what becomes of responsibility once the identity of the I trembles in secret?" 29. "I know no subject more elevating, more amazing, more ready to the poetical enthusiasm, the philosophical reflection, and the moral sentiment than the works of nature. Where can we meet such variety, such beauty, such magnificence?" 30. "My life is essentially not so unique. On some deeper levels we feel the same, we know the same things. Therefore if I show my life 365 days, moments from those days, it will reflect and it will have connection with lives of all of us." 31. "It has seemed to me sometimes as though the Lord breathes on this poor gray ember of Creation and it turns to radiance - for a moment or a year or the span of a life. And then it sinks back into itself again, and to look at it no one would know it had anything to do with fire, or light. This is what I said in the Pentecost sermon. I have reflected on that sermon, and there is some truth in it. But the Lord is more constant and far more extravagant than it seems to imply. Wherever you turn your eyes the world can shine like transfiguration. You don't have to bring a thing to it except a little willingness to see. Only, who could have the courage to see it?" 32. "But I guess that's just a reflection of how the educational system today, being so overcrowded and impersonal, makes it so hard for adolescents to break through the preconceived notions of one another, and get to know the real person underneath the label they're given, be it Princess, Brainiac, Drama Geek, Jock, Cheerleader, or Guy Who Hates It When They Put Corn in the Chili." 33. "Her life with others no longer interests him. He wants only her stalking beauty, her theatre of expressions. He wants the minute secret reflection between them, the depth of field minimal, their foreignness intimate like two pages of a closed book." 34. "The pig was soon dissected and its blood filled the bucket in the bottom of which a patch of sky was reflected darkly. It had surrendered to the vortex of life and his breathing." 35. "Mi-am adus aminte de cerceii Liviei si i-am spus ca încercam sa înfatisez un nor de lacuste care devora o catedrala. "Dumnezeu mâncat de lacuste, îti place ideea?" Privirea ei uluita m-a încurajat sa continui: "Dintr-un vis mi-a venit ideea. Am visat ca rataceam într-o lume cu temple închinate lacustelor, cu preoti îmbracati în odajdii pe care erau tesute cu fir de aur lacuste si cu nenumarate lacuste care îi devorau pe toti cei ce nu credeau în ele. Ma feream sa scot o vorba, sa nu se afle ce gândeam, pâna ce, reflectându-ma într-un geam, am observat ca eu însumi devenisem o lacusta. Nu se poate când traiesti între lacuste si nu faci nimic împotriva lor sa nu devii tu însuti ca ele, mi-am zis cu amaraciune"." 36. "When the talk about my troubles was loudest, I did the thing I've always spoken of most . I got still and listened for the answer to What is this here to teach me? The answer, first and foremost? Lay your ego down. Step out of your ego so you can recognize the truth. As soon as I did that, I was able to see the role I had played in creating "my circumstances," without blaming other people. And -- bingo! -- I realized that all the noise about my struggle was a reflection of my personal angst and fear." 37. "Why should I cumber myself with regrets that the receiver is not capacious? It never troubles the sun that some of his rays fall wide and vain into ungrateful space, and only a small part on the reflecting planet. Let your greatness educate the crude and cold companion." 38. "Yes!" Narissus unslung his bow and grabbed an arrow from his dusty quiver. "The first one who get that bronze, I will like you almost as much as I like me. I might even kiss you, right after I kiss my reflection!" "Oh my gods!" the nymphs squealed." 39. "Peace of mind produces right values, right values produce right thoughts. Right thoughts produce right actions and right actions produce work which will be a material reflection for others to see of the serenity at the center of it all." 40. 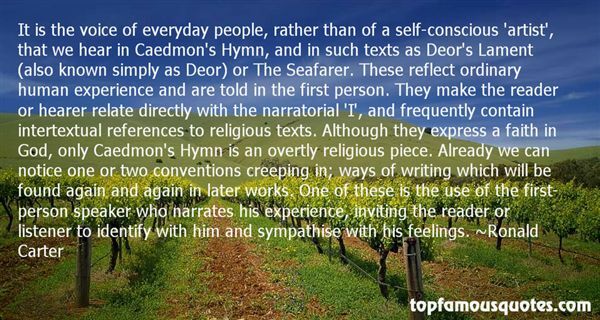 "It is the voice of everyday people, rather than of a self-conscious 'artist', that we hear in Caedmon's Hymn, and in such texts as Deor's Lament (also known simply as Deor) or The Seafarer. These reflect ordinary human experience and are told in the first person. They make the reader or hearer relate directly with the narratorial 'I', and frequently contain intertextual references to religious texts. Although they express a faith in God, only Caedmon's Hymn is an overtly religious piece. Already we can notice one or two conventions creeping in; ways of writing which will be found again and again in later works. One of these is the use of the first-person speaker who narrates his experience, inviting the reader or listener to identify with him and sympathise with his feelings." 41. "My writing is a combination of three elements. The first is travel: not travel like a tourist, but travel as exploration. The second is reading literature on the subject. The third is reflection." 42. "I'm curious to see, now that beauty is gone, what will be reflected in a mans eyes." 43. "Stand-up comics reflect less of a visual humor and more of a commentary." 44. "Not that I've ever feared a fight or backed down from one –(Wren)That's the truth. I swear he's half beta fish. He'd fight his own reflection to prove a point. (Maggie)"
45. "Much is being said of deep crime which darkens heaven's windows. We shudder at immoralities which terrify us. We nearly panic at the divorce frequency and broken homes and delinquent children about us. But perhaps sometimes we should stop to reflect that all are not criminals, all are not bad, and all are not rebellious. . . . The gospel of Jesus Christ teaches men to live righteously, to make the family supreme, the home inviolate. It moves the characters of its adherents toward faultlessness. It is the true way. If lived rightly it will ennoble men toward Godhood"
46. "(Quoted by Thomas Carlyle) The rude man requires only to see something going on. The man of more refinement must be made to feel. The man of complete refinement must be made to reflect." 47. "To be in Florence is to reflect on Europe's intricate diversity - and its lost creativity." 48. "Well, Daddy, I used to believe that artists went crazy in the process of creating the beautiful works of art that kept society sane. Nowadays, though, artists make intentionally ugly art that's only supposed to reflect society rather than inspire it. So I guess we're all loony together now, loony rats in the shithouse of commercialism." 49. "Popular culture is simply a reflection of what the majority seems to want." 50. "Be a reflection of what you'd like to see in others. You get in return what you give." I have heard of novels started in the middle, at the end, written in patches to be joined together later, but I have never felt the slightest desire to do this."